St. Clair County Central Dispatch is separate, individual department within the County Government. Operations are overseen by a Director; shifts have an assigned Senior Dispatcher as well. The Director takes direction regarding policy and operations from the Central Dispatch Advisory Board comprised of 13 members. Each member represents a larger organization within the County, such as police, fire, Medical Control, Townships and Cities. 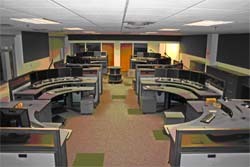 The Dispatch Center is under the direct authority of the County Administrator. It is our mission at St. Clair County Central Dispatch to provide superior and professional service while showing compassion and attentiveness to the Citizens, Visitors and Public Safety responders of St. Clair County. We are committed to providing this service in the most efficient and accurate manner possible. We are committed to maintaining a professional and respectful workplace that provides an atmosphere of trust and teamwork. We are committed to being proactive and progressive in the 911 field in order to provide the citizens and responders of St. Clair County with the best service available. We work hard to fulfill our mission in a manner that inspires trust and confidence from the public and the agencies we serve.